This pâté-style loaf provides complete, balanced nutrition and a source of moisture that can be beneficial to small dogs. Gram-for-gram, wet foods like the Cesar® brand have fewer calories than dry food. Paired with Cesar® Dry food, it makes a perfect meal for small dogs. Now you can add more diversity to your small dog's meals by picking up our convenient variety 18-pack! 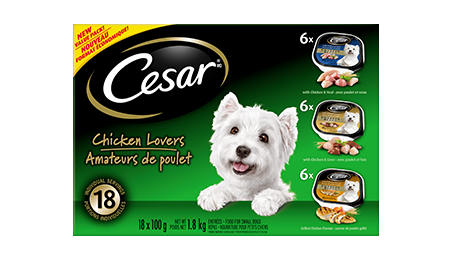 CESAR® ENTRÉES: CHICKEN LOVERS 6 WITH GRILLED CHICKEN, 6 CHICKEN VEAL & 6 CHICKEN LIVER 18x100g is rated 4.5 out of 5 by 37. Rated 5 out of 5 by LISAVBC_3611026173 from I have the sweetest, but the most pickiest Yorkie! She grows very bored with her food and will not finish her bowl. Tried Cesar wet food and she gobbled it down, didn't even stop to breathe in between bites! Within minutes she had licked every morsel from her bowl, I have never seen it so clean! Cesar is now tops in my house, perfect for the pickiest eaters! Rated 5 out of 5 by PAULRNB_361985055 from Great packaging and very convenient larger pack of 18. My little Missy absolutely loves these. We just tell her it's Cesar Time and she goes crazy. Very good quality and you can't go wrong with a trusted brand like Cesar. I will definitely keep buying these and they also have an amazing variety to chose from. Rated 5 out of 5 by MELANIEZBC_361971467 from My dog normally eats raw food, but we find it difficult to bring raw food with us when travelling. Bringing along individual packs of Cesar wet food gives my dog the texture of raw food without the hassle of having to refrigerate. My dog enjoyed the Cesar food as much as she enjoys raw food. Rated 5 out of 5 by ZSOLTSON_361989411 from This is the perfect wet food to mix into my Border terriers dry food in order for him to want to eat it. He loves the variety in flavors and I surprise him daily with a new taste for his pallet. My dog lives Cesar and will loyalty enjoy for years to come. Rated 5 out of 5 by JODIRMB_3611004453 from I love how this food is portioned out in small easy to open trays that are the perfect serving size for my small dog. He loves the chicken flavor and I like the fact that there are easy to understand ingredients from a brand that I trust. Rated 5 out of 5 by KIMSBC_3611009527 from What a special treat for my 2 little dogs! They loved Cesar chicken wet food! These servings are perfect for adding on top of your dogs kibble for a special treat or bringing along while travelling for disposable single servings. CESAR® Entrées Grilled Chicken Flavour Food For Small Dogs is formulated to meet the nutritional levels established by the AAFCO Dog Food Nutrient Profiles for maintenance. CESAR® Entrées With Chicken & Veal Food For Small Dogs is formulated to meet the nutritional levels established by the AAFCO Dog Food Nutrient Profiles for maintenance. CESAR® Entrées With Chicken & Liver Food For Small Dogs is formulated to meet the nutritional levels established by the AAFCO Dog Food Nutrient Profiles for maintenance. Grilled Chicken: MEAT BY-PRODUCTS, LIVER, CHICKEN, CHICKEN BY-PRODUCTS, MINERALS AND VITAMINS, GUMS, COLOURS, DRIED YAM, NATURAL FLAVOURS, GRILLED CHICKEN FLAVOUR, SODIUM NITRITE (FOR COLOUR RETENTION), WATER SUFFICIENT FOR PROCESSING. Chicken & Veal: MEAT BY-PRODUCTS, LIVER, CHICKEN, VEAL, CHICKEN BY-PRODUCTS, MINERALS AND VITAMINS, GUMS, DRIED YAM, NATURAL FLAVOURS, COLOURS, SODIUM NITRITE (FOR COLOUR RETENTION), WATER SUFFICIENT FOR PROCESSING. Chicken & Liver: MEAT BY-PRODUCTS, CHICKEN BY-PRODUCTS, CHICKEN, LIVER, MINERALS AND VITAMINS, GUMS, DRIED YAM, NATURAL FLAVOURS, COLOURS, SODIUM NITRITE (FOR COLOUR RETENTION), WATER SUFFICIENT FOR PROCESSING.